Overview - An epic tale of vengeance and survival Gangs of New York now hits harder than ever on Blu-ray Disc. Directed by Academy Award winner Martin Scorsese (2006, Best Director, The Departed), this motion picture event stars two-time Oscar winner Daniel Day-Lewis (1989, Best Actor My Left Foot; 2007, Best Actor, There Will Be Blood), Leonardo DiCaprio and Cameron Diaz. Feel your heart pound while weapons and cultures clash in a chaotic symphony of life and death. Surrender to the tumultuous atmosphere of 1860s New York as phenomenal sound and stunning visual clarity transport you back in time. Prepare to experience Scorsese s masterpiece as never before on Blu-ray high definition. Portions of this article first appeared in our review of the earlier Blu-ray release of 'Gangs of New York'. Even great artists stumble on occasion. Arguably America's best living filmmaker, Martin Scorsese had grand ambitions for his historical epic 'Gangs of New York'. Long fascinated by organized (and disorganized) crime and its roots in American culture, the director claims to have been planning an adaptation of Herbert Asbury's 1928 non-fiction book on-and-off since stumbling across it in early 1970. The material, an account of gang violence and political corruption in Civil War-era New York City, certainly seems right up his alley. Afforded a mammoth budget approaching $100 million (his largest at the time) and free reign to recreate 19th Century New York on the famed Cinecittà studio lot in Rome, the project was finally green-lit for release in 2002. The resulting film tells a sprawling narrative on a sweeping scale, with stunning production values and an A-List cast. It's also something of a huge mess. The story begins with the Battle of Five Points in 1846, where bands of rival gangs have aligned themselves into two camps warring for control of their miserable slum. The self-proclaimed "Native Americans" (chiefly White Anglo Saxon stock born in the country) led by Bill "The Butcher" Cutting (Daniel Day-Lewis) face off against immigrants (primarily Irish) led by Priest Vallon (Liam Neeson). They wage a bloody conflict involving knives, bricks, bats, and other blunt instruments in the city streets. Bill wins, brutally. Jumping ahead 16 years, Vallon's son (Leonardo DiCaprio), having spent his formative years hardening his resolve in a House of Reform, returns to the area seeking vengeance for his father. Now going by the moniker Amsterdam (real subtle there, Marty), the young man allows himself to be taken under Bill's wing to learn about his operation and get close to the man. However, he soon finds his feelings conflicted by a growing admiration for father-figure Bill and a shared romantic interest in comely pickpocket Jenny (Cameron Diaz). This all occurs against a backdrop of rampant corruption centered around William "Boss" Tweed (Jim Broadbent) and his Tammany Hall cronies. Tweed has his hands deep in organized crime's pockets and runs the police and fire brigades as nothing more than his own savage gangs on the city payroll. All the while, escalating racial tension in the city has been inflamed by implementation of the country's first military draft. This will all culminate in the Draft Riots of 1863, in which huge mobs overrun Manhattan destroying everything in their wake. Daniel Day-Lewis is an absolute force of nature as Bill. It's another astounding performance in a career filled with them. He swallows up any scene he's in. Less impressive is DiCaprio, who tries too hard to shake off his pretty boy image by beefing up and affecting an unconvincing "Oirish" accent. Don't get me wrong, DiCaprio is usually a fine actor who has capably carried other movies; this just isn't his shining moment. Diaz is flat-out miscast and is frankly awful in her role. The movie certainly has a lot going on. That's both an asset and a liability. The scale of the picture is suitably epic, with amazing production design and costumes. 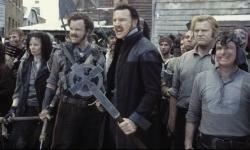 Scorsese does an excellent job capturing the atmosphere of general anarchy dominating the age. The various themed gangs with their odd names (the Dead Rabbits, the Bowery Boys, the Plug Uglies, the Shirt Tails, etc.) and coordinated outfits are both menacing and strangely fantastical at the same time. (In some ways, the picture is reminiscent of 'The Warriors' for its crazily surreal depiction of inner city crime.) The story deals with many important themes, and the director orchestrates several set-pieces of enormous scope and visionary artistry. And yet, at the end of it all, the whole thing feels unfocused and disjointed. The script is too talky, with clunky voiceover narration attempting to patch over gaps in the story. At just shy of three hours in length, there's a lack of momentum, and far too much emphasis placed on the uninteresting romance between Amsterdam and Jenny. Scenes of little consequence are allowed to drag on without reason, while others that would seem important are skimmed over and cut short. On top of it all is one of the worst musical scores ever recorded for a motion picture. (Howard Shore must have stretched himself too thin between 'Lord of the Rings' installments.) Worse, the film is capped by an especially treacly and mood-breaking pop ballad by U2 as soon as the end credits come up. 'Gangs of New York' is a movie that reaches for great things, and has moments of genuine greatness within it, but on the whole never pulls together. It's a big disappointment from Martin Scorsese. 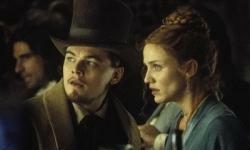 Fortunately, the director would bounce back to form with his next pair of features, 'The Aviator' and 'The Departed'. When Buena Vista Home Entertainment first released 'Gangs on New York' on Blu-ray in mid-2008, the results were frankly terrible. The studio recycled an old video master that looked pretty awful when it first appeared on DVD back in 2003. High-definition encoding just brought out all the flaws even more. A French Blu-ray release from M6 video looked slightly less atrocious, but only slightly. That import wasn't particularly satisfying either. After a year and a half of customer complaints, Buena Vista has finally decided to give the movie a proper remaster. The new disc can be distinguished from the original edition by the Miramax Award-Winning Collection banner on the front cover. Other than the video transfer, not much has changed here. The new Blu-ray has no additional bonus features beyond those that appeared on the last Blu-ray. The disc has three forced trailers before the main menu. Night and day. The remastered 'Gangs of New York' has been improved over the last Blu-ray in nearly every way. Whereas the previous disc was smothered in Digital Noise Reduction and thick, disgusting edge enhancement artifacts, the new 1080p/AVC MPEG-4 transfer has little to none of either. The artificially boosted contrast that caused colors to bloom and gave white snow a radioactive glow has been tamed and returned to more suitable levels. The lack of electronic sharpening may give some viewers the impression that the image is "softer" now, but it actually exhibits much better resolution of textural and fine object detail. The 2.35:1 picture seems to be slightly cropped around the edges in direct comparison to the old copy. That wouldn't be at all noticeable without back-to-back viewing. In fact, the last disc appeared to have too much picture exposed from the camera negative. Colored vertical stripes were regularly visible on the left and right sides. As I mentioned in my prior review, shaving a tiny bit of picture off the sides would have been less distracting. That appears to be what happened here, and I think it was the right decision. I wouldn't call the new disc quite perfect. The shot at 15:42 where Amsterdam hugs the priest still shows a noticeable edge halo problem, for example. Fortunately, it's much reduced here. A slight bit of smeariness still permeates some scenes. But, again, it's nowhere near as bad as it used to be. Film grain is visible and no longer freezes in unnatural patterns. However, the very first shot of the movie (a close-up of Liam Neeson's nose) doesn't show any of the grain that was evident on the French Blu-ray there. It's entirely possible that the grain was exaggerated on that disc by the artificial sharpening, though. In general, the new transfer still looks just a bit "digital" in places. That's a minor complaint. This is far and away a major improvement and the best the movie has ever looked on home video. Not only is this is the only copy that's at all watchable on a large high-def screen, it holds up very well on one. The beautiful cinematography by Michael Ballhaus is finally allowed to shine. I only wish that we'd gotten a transfer this nice the first time around. The first Blu-ray had an uncompressed PCM 5.1 soundtrack. For the remaster, Buena Vista has re-encoded the audio into lossless DTS-HD Master Audio 5.1 format. As near as I can tell, they sound exactly the same. Since both audio formats are bit-for-bit identical to the original master, that only makes sense. For that reason, I'll just repeat what I said about the earlier disc's soundtrack here. The mix has nice bass thump and impact, especially the pounding cannon fire during the climax. Sound effects such as clanging knives and other metallic weapons are sharply recorded, and gun shots have a satisfying crack. Dialogue is always clear and intelligible, and even shifts directionally across the front soundstage from time to time (rare in modern movies). Surround usage is only moderately aggressive, but decidedly picks up during the Battle of Five Points and Draft Riot sequences. The soundtrack exhibits pleasing spaciousness and fidelity in both quiet and loud scenes alike. Any disappointment I may have stems directly from the movie itself, not its audio presentation on Blu-ray. 'Gangs of New York' has a surprisingly bland and uninspired sound design, with a lousy musical score and countless scenes that are just sonically dull. That isn't the Blu-ray's fault, but I certainly won't be pulling this disc off the shelf when I want an audio demo. The Miramax Award-Winning Collection Blu-ray has the exact same assortment of bonus features found on the original Blu-ray, all of which first originated on DVD. There's nothing new to this edition. Audio Commentary – Martin Scorsese is an old pro at the commentary format, and as usual delivers an engaging talk during the movie. This is a long film, and there are a few gaps here and there, but he provides a lot of interesting information about the origins of the project, his inspirations, his personal connection to New York City and his fascination with its history, casting the movie (DiCaprio was cast on the advice of Robert De Niro), thematic concerns, and the challenges of structuring and editing such a sprawling story. One can forgive the director for thinking that the movie turned out better than it really did, but this commentary allows a new appreciation for what he was trying to achieve. History of the Five Points (SD, 14 min.) – Historical advisor Luc Sante discusses the real Bill "The Butcher," the Draft Riots, the Boss Tweed and Tammany Hall scandals, and the rampant corruption among police and firefighters. He also explains how the "yellow" press of the day distorted the news so badly that there are few reliable historical accounts from the time period. Set Design (SD, 9 min.) – Production designer Dante Ferretti talks about his collaboration with Scorsese, the historical research needed, and shows us some technical drawings and models. Exploring the Sets of Gangs of New York (SD, 23 min.) – Scorsese and Ferretti take us on a walking tour of the massive city sets built on the Cinecittà lot in Rome. Costume Design (SD, 8 min.) – Designer Sandy Powell explains the mixture of historical accuracy and heightened fantasy stylization in the wardrobe. Discovery Channel Special: Uncovering the Real Gangs of New York (SD, 35 min.) – A very promotional TV special with a skimming overview of the history of old New York, and specifically the Five Points district, which was described as "the most dangerous slum in the world." Clips from the movie are repeatedly plugged. Trailers (SD, 5 min.) – One teaser and one full theatrical trailer. The latter shamelessly spoils a rather big plot development. 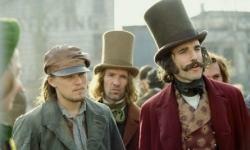 I'm still not in love with 'Gangs of New York' as a movie. Although it's a notable footnote in Martin Scorsese's career, the film is nowhere near the masterpiece that it set out to be. With that said, the new Blu-ray edition is a huge improvement over the last one. Anyone with an interest in 'Gangs of New York' should seek out this copy. Unfortunately, the studio has not opted to offer an exchange program for owners of the prior Blu-ray, as Sony Pictures was nice enough to do after it fixed its 'Fifth Element' disaster. And the $39.99 MSRP on this catalog title is pretty galling, to say the least. Apparently, Buena Vista expects fans to pay top dollar to rebuy a new copy of the movie that it screwed up the first time around. The studio has quite a few things to learn about customer service and generating good will among its target audience.